SIEF supports high performance and efficient wireless communication. The rapid take up of mobile smart phones, coupled with the expected explosive growth of Internet-enabled devices (Internet of Things), is driving an unprecedented demand for wireless data connectivity. However, the wireless spectrum available to support this growth is rapidly exhausting. A Spectrum Crunch is imminent unless innovative ways are found to make spectrum use more efficient. Further, there is a growing digital divide between those who live in metropolitan areas and those in remote and rural areas when it comes to access to reliable, high-data-rate broadband communications. This divide locks people living in these regions out of the Digital Economy, hence lowering social equity. The Ngara* Research project was established to accelerate the development of advanced wireless technologies to address these challenges. The initial research focused on delivering high-data-rate, spectrally-efficient broadband services to rural and regional areas. 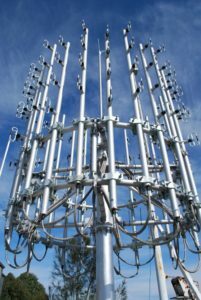 The aim of this research was to demonstrate the world’s most spectrally efficient point-to-multi-point access technology and the world’s highest capacity microwave point-to-point link. CSIRO is now partnering with several prominent local manufacturers of telecommunications equipment to commercialise the initial Ngara technology. CSIRO is also collaborating with a significant telecommunication service provider and a leading university to investigate further applications of the Ngara technology. the impact of the spectrum crunch on Australia’s economic, social and environmental fabric. Reduced network infrastructure costs compared to fixed broadband alternatives. Fewer wireless infrastructure sites, and resulting reduced visual and environmental impact. narrowband spectrum, e.g. video-capable narrowband public safety communications networks. Reduction in the digital divide between metropolitan and regional and rural Australians. Download: Ngara Wireless Information and Communication Technologies brochure. * Ngara – a word of the Darug people meaning to listen, hear and think. Darug elders gave their permission to use the word at a ceremony at CSIRO’s laboratory in the Sydney suburb of Marsfield – part of Darug lands.